Version one will be finished in Heritage Cherry or a Heritage Dark Burst and comes with a ’59 handful neck shape. The early 1960’s models had similar specs to the ’59 so this makes good sense. This one comes with top-hat control knobs. Version two has a thinner, elliptical neck profile; the middle step to the slim ’60s neck. This version comes with ‘faded’ sunbursts – a Light Iced Tea and a Sunset Tea burst. Version three has that slim-taper ’60s neck. 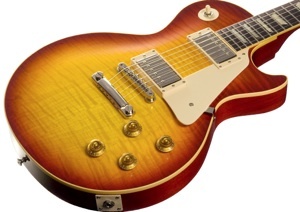 It’s finished in a colour-fast Cherry burst and comes with double-line tuners and gold top-hat knobs. 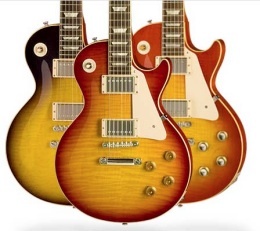 All the guitars share period-correct features that you’d expect. Nitrocellulose lacquer finishes, 17-degree headstocks, nickel plated hardware and aluminium strap buttons. Pickus are BurstBuckers and their lovely noise is controlled by proper CTS pots and bumblebee tone capacitors. Nice. These are a Custom Shop limited run of just 500 instruments. Recommended pricing is US $8,504.